“There’s one!” calls a tall guy in an olive-drab raincoat. Slowly, gingerly, several members of the group step through the wet wildflowers toward the place where he’s pointing. There sits a tiny butterfly, no bigger than an inch from wingtip to wingtip. 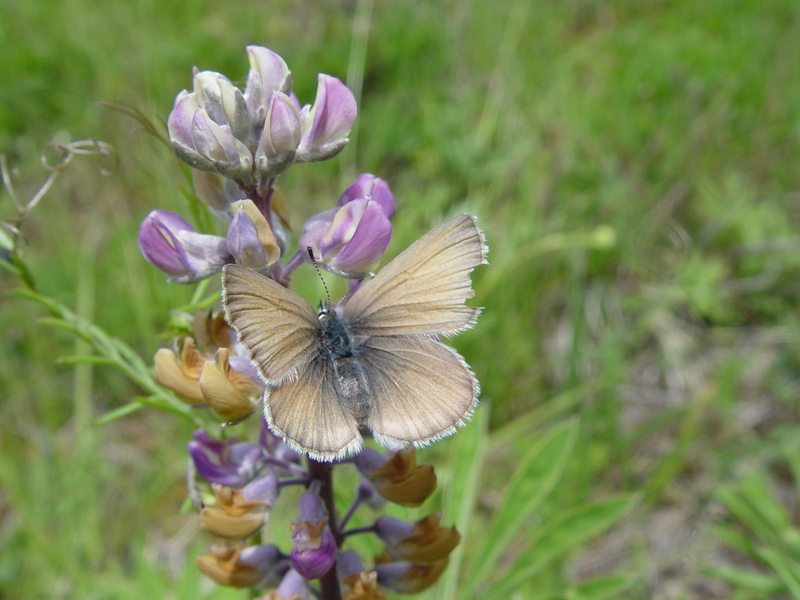 Digital cameras emerge from jacket pockets to capture the pale, bluish insect, nearly camouflaged on a pale, bluish blossom, the Kinkaid’s lupine, upon which the butterfly depends for sustenance throughout its lifecycle. The tiny winged creature is a member of an endangered species — the Fender’s blue butterfly — newly emerged from its pupa and collecting nectar on a wildflower that is itself becoming more and more scarce. Getting a glimpse of the rare butterfly is a testament to the success of a long-term, multiagency project to restore native grasslands in the rural community of Wren. For the 15 people taking the Watershed Council’s Memorial Day prairie restoration tour, the Fender’s blue sighting confirms the soundness of the presentations by scientists, landowners and local consultants who are on hand to show off the results of nearly a decade of restoration efforts in the gently rolling hills along the Marys River. 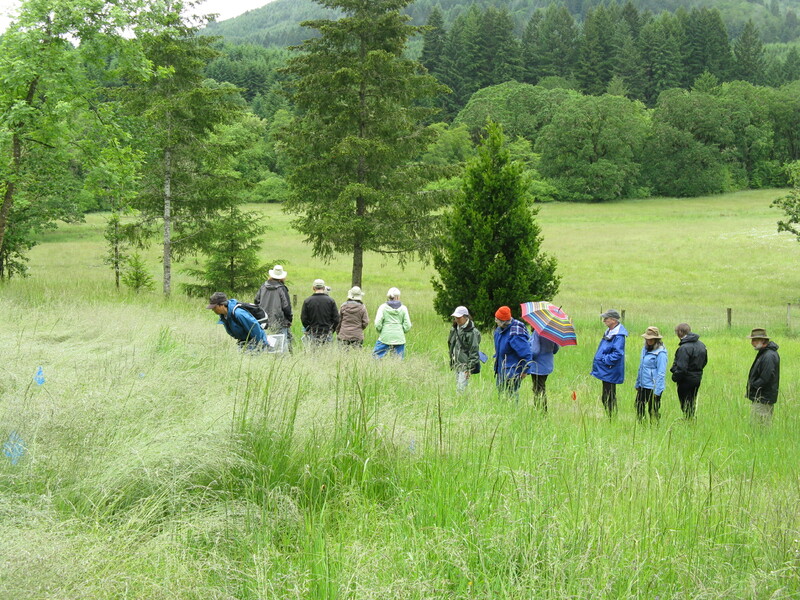 The multi-phase project — led by the Watershed Council and the Oregon Department of Fisheries and Wildlife in collaboration with a number of landowners, Oregon State University and other partners — aims to reclaim the oak woodlands and flower-studded grasslands that have been lost to agriculture, fire suppression and conifer encroachment over the past 150 years. McGee stands beside the meadow listening as Lesko tells the prairie tourists the couple’s personal restoration story: cutting dozens of Douglas firs to let sunlight reach the native white oaks. Spraying harmful invasive weeds that were choking off wildflowers. Hovering over the reclaimed meadow with the anxious concern of a new parent. She looks at the blue flags dotting a stand of fescue to mark the lupine starts and thinks about how far she and Lesko have come under the Watershed Council’s guidance. Henry Storch is a familiar presence in Wren, traveling the back roads in a dusty truck advertising his farrier service. But shoeing horses is just one of his trades. He keeps bees, too. And he sells native seeds. He knows wildflowers backwards and forwards, which puts him in high demand for the restoration projects underway in Wren. Walk around Wren with Storch – whose grandmother taught him Latin at age 4 — and within minutes he’ll have your head spinning with flowers, bees, and random bits of horticultural information: Rose checkermallow (“a nice native”). Callicordis (“primo nectar for the Fender’s and the Taylor’s checkerspot”). English plantain (“the principle host for the Taylor’s). Camas (pretty basic). Bombus mixus (“a cavity nester”). Wyethia (“native sunflower”). Vetch (non-native, but functional for pollinators. Bombus Californicus. Lupinus organus (“a hybrid species with a really stinky smell).